A production where music is undivided and seen as a whole. They present 12 musical pieces in one evening ranging from genres of Hindustani music such as classical, ghazal, thumri, folk, Sufi and kathak. Each piece is well rooted in the traditions in terms of its Gayaki and the lyrics and enveloped in a soundscape that incorporates world genres such as drum and bass, dubstep, jazz etc. It is an Initiative by Vocalist/Songwriter MIRANDE who has been Trained in Hindustani classical music under specialised Guru Shishya tutelage of Smt. Kaushiki Chakrabarty and Shri Aniket Khandekar. Blessed with impeccable honeyed timbre intonation, her soulful voice teleports you to ecstasy in no time. She started her musical journey at the tender age of 14. Her outstanding performance on national television set the grounds for her magnificent start. 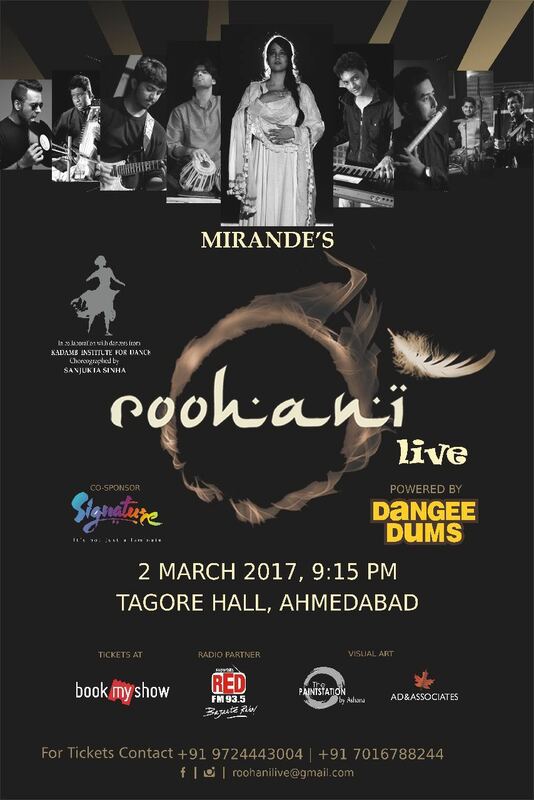 Alongside the musicians, Roohani is ecstatic to collaborate with Dancers from Padma Bhushan KUMUDINI LAKIA JIi’s Kadamb institute for kathak and Choreographer/ Danseuse SANJUKTA SINHA.